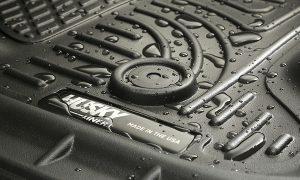 Husky Liners announced that its WeatherBeater floor liners are now available for 2017 F-250, F-350 and F-450. WeatherBeater floor liners feature raised edges to help contain spills and conform to the contours of the vehicle’s floor for a snug fit. StayPut Cleats on the bottom of WeatherBeater floor liners keep them from shifting around on either carpet or vinyl floors. WeatherBeater liners, which are designed and made in the U.S., come with a lifetime guarantee.